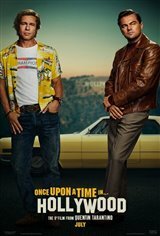 In 1969 Los Angeles, once-famous TV actor Rick Dalton (Leonardo DiCaprio) finds out it’s much harder to make the transition to film than he thought, and now finds himself struggling to maintain any career at all. Just as he begins contemplating a move to Italy to take part in the growing world of Spaghetti Westerns, he and his stunt double Cliff Booth (Brad Pitt) decide to team up to pursue careers in film, right around the time of the infamous Charles Manson murders. And as it just so happens, one of the victims, Sharon Tate (Margot Robbie), is Dalton’s neighbor.